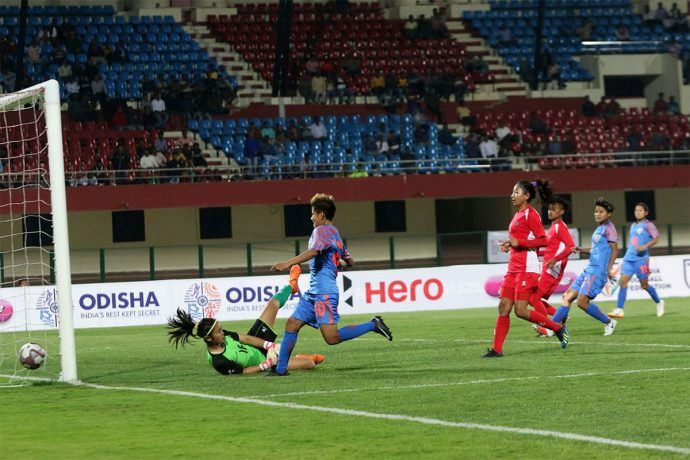 Sabitra Bhandari (4′, 6′) struck two early goals to hand the Blue Tigresses a 1-2 defeat in their second game of the Hero Gold Cup at the Kalinga Stadium in Bhubaneswar tonight (February 11, 2019). Although Ratanbala Devi (83′) hit the target from a free-kick, it couldn’t deter the away team from gathering all three points to stay afloat in the four-nation championship. After the second game day, Myanmar stay firmly seated at the top of the table with 6 points from 2 games whereas India and Nepal are locked in second place with 3 points each. IR Iran are yet to open their account having played an equal number of games. Maymol Rocky’s girls changed the gear in their quest to find the target and Dalima Chibber could have hit the target form a long-ranger but her effort missed the target by a whisker. In the 40th minute, Sanju’s lay-off was collected by Jabamani Tudu but her cross proved to be too heavy for onrushing Anju Tamang. India got two back-to-back chances to breach the strudy Nepalese defence in the 73rd and 74th minute but eventually, the score line remained same. Sanju and Sandhiya, who replaced Anju Tamang in the 57th minute, coordinated well but failed to find the back of the net because of the confusion between them. A minute later, Sanju tucked in a goal but she was ruled offside. India will face Myanmar in the final game of the group stage at the same venue on Wednesday (February 13, 2019).